Josiah Magnuson has been active and involved as your representative. He possesses the unique ability to respect and work with people of any ideological viewpoint while standing firm to vote according to his deep conservative convictions. Josiah understands that the future of our country is at stake today, and that's what gives him the courage to fight for our families. As your representative, Josiah shares your frustration with state government. He has consistently worked to clean up Columbia, fighting to reform the roads and transportation system, state employee pensions, legislative bureaucracy, election of judges, and more. Josiah is working with other conservatives in the House and Senate to develop common sense solutions that will make South Carolina a better place. He believes greater liberty and greater government accountability will lead to greater prosperity. Josiah has been true to his promises: voting against the gas tax hike, fighting to define life at conception, building bridges toward real judicial reform, helping organize a new Family Caucus to stand together for traditional values, and vocally advocating for the First, Second, and Tenth Amendments. A small government champion, Josiah Magnuson was awarded an A+, a higher grade than any other House member in 2017, from the Club for Growth. Josiah has consistently worked to defend the taxpayer against ever-growing state spending. He believes the priorities in Columbia are often in the wrong places. One example occurred during the budget debate this year when Josiah advocated for $5 million in funding for school resource officers, but the House voted down his amendment and instead spent the money on tourism advertising! Josiah seeks to fully fund core functions of government like our roads, education, courts, and law enforcement rather than throwing money away on pet projects. Josiah lives out his belief in transparency. Since his election, Josiah has held monthly town hall events, provided consistent email updates on how he is voting, and been responsive on Facebook and by phone. You can call his personal cell at 864-420-7933, or connect directly with him on Facebook at www.fb.com/magnusonsc. Josiah Magnuson is an educator and business development executive from Campobello, South Carolina. Born in Greenville as the son of a Baptist pastor, Josiah's family moved several times as God opened ministry opportunities. Homeschooled through his sophomore year, Josiah graduated from Kingsway Christian School in Orrville, Ohio in 2010. But he couldn't stay away from the South. Josiah settled back in the Upcountry following his graduation, studying for two years with Oak Brook College of Law. As Providence directed, Josiah received an opportunity to train in electric work. He has worked for Griffin Electric in Greer and Clark Electric in Spartanburg, and currently works with Century Slate and Solar in Taylors, SC. Though he's not an attorney and doesn't consider himself a politician, Josiah has long been active in the political process. As a teen, he was motivated by the writings of Thomas Jefferson and other American Founders. Josiah became an avid researcher of history and often tuned in to conservative talk radio. In 2004, the Greenville News published his first letter to the editor, on the danger posed by illegal immigration and the need to secure our border. In the spring of 2007, Josiah along with others in his family and a small group of committed patriots successfully worked to pass the bill banning South Carolina from implementing the unconstitutional Federal REAL-ID Act. Josiah had the privilege of standing behind Governor Mark Sanford as the bill was signed into law. This God-given victory provided an inspiration for him to continue taking action at the legislature on a variety of issues, including sound money, rejection of Obamacare, personhood for unborn children, traditional marriage, and more. Also in 2007, Josiah founded Soldiers of Biblical Reformation (SBR), a nondenominational Christian club to bring families together to uphold God's design in all of life, including the realm of civil government. Josiah believes that our faith should be bigger than Sunday mornings. Through mentorships, training events, Bible studies, service projects, and outreach trips, Soldiers of Biblical Reformation has equipped many young people to be a light in the community and the culture. Josiah has taught a number of additional classes independently, including elementary science, high-school American History, and the U.S. Constitution for all ages. From 2012 to 2017, Josiah served as director of Americans for Constitutional Government (ACG). Founded in 1962, ACG is the longest-running conservative action group in the Upcountry. In this capacity Josiah facilitated a meeting each month with educational speakers, two annual banquets, and a variety of action projects. He also organized multiple bus trips to Columbia to assist citizens in meeting and influencing their representatives. 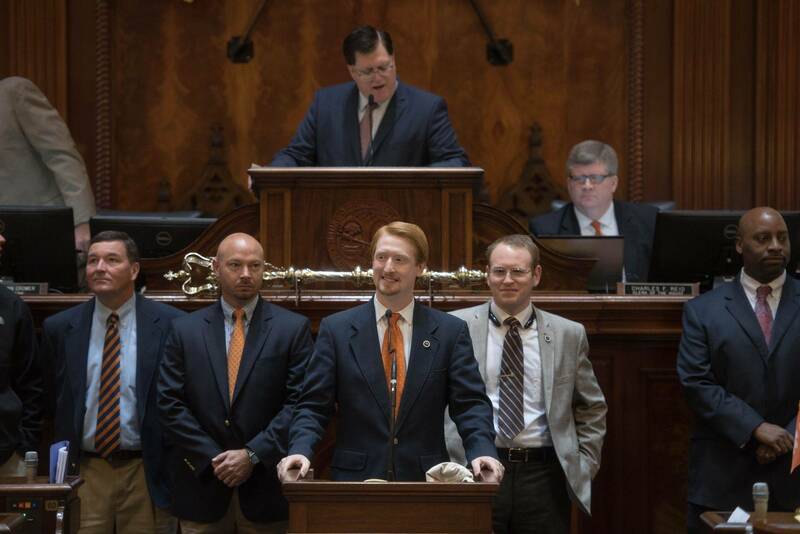 In 2015, Josiah along with SC Rep. Jonathon Hill (R-Anderson County) founded The Virtue Solution Project, an effort to combat apathy to restore the fabric of America from the ground up. Josiah believes the future of liberty rests on the moral courage to do right, community self-sufficiency, and love for our neighbors. When we depend on God and each other we don't have to depend on big government. These themes figured prominently in President Trump's State of the Union address this year. One example of this "real America" as President Trump explained is the "Cajun Navy" in Louisiana and Texas that volunteered to rescue victims of Hurricane Harvey. The Virtue Solution Project aims to replicate this volunteer spirit across America, putting into practice the values the Founders told us would preserve liberty. Josiah sees the vision of America's Founders as the right course for our country. This vision requires limits on government. As your state representative, Josiah aims to utilize the Tenth Amendment to limit rising Federal overreach of its rightful constitutional powers. Josiah is a member of Mountain View Baptist Church, north of Cowpens, SC. Look for the big red cross on I-85! As your representative, Josiah Magnuson fights for your values. He is a voice of courage in Columbia, and you can be confident in his record of leadership. If you have any questions, feel free to call him at 864-420-7933.